We stock two basic 10k pots; a standard 300°, and our own 50° version. 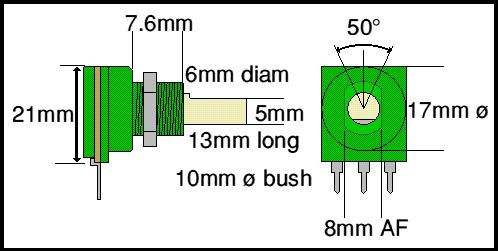 We have two versions of a simple potentiometer, a standard 10K linear pot with a 300′ arc, and a custom made 50° version. Both these pots are plastic bodied with a plastic shaft so they have good water resistance. They are IP50 rated by the manufacturer (Omeg Ltd). We consider pots to be a bit like car brake pads, they have a spring loaded arm which presses on a carbon track, carbon is quite soft and will wear out if it is used a lot. A lot of intermittent control problems are solved by replacing the pot. A standard 10K linear pot (10K ±20%) to suit all our controllers (except Porter 40). The shaft rotates through 300°. 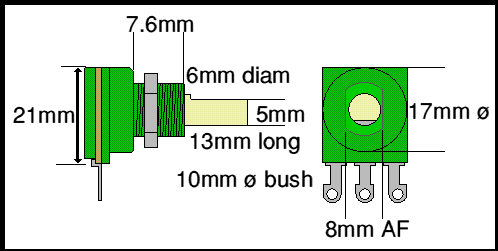 It it of the same dimensions as the 50° pot below, but with solder tags rather than PCB pins. This is a pot made specially for 4QD: it is a ‘standard’ 10K (10K ±20%) linear pot (i.e. with 300° mechanical travel) but with the active part of the track (i.e. the actual resistive track) occupying only the centre 50° of the mechanical travel. It has a 6mm diameter shaft and is normally used in our Boxed throttle and Finger-tip throttle mechanism. 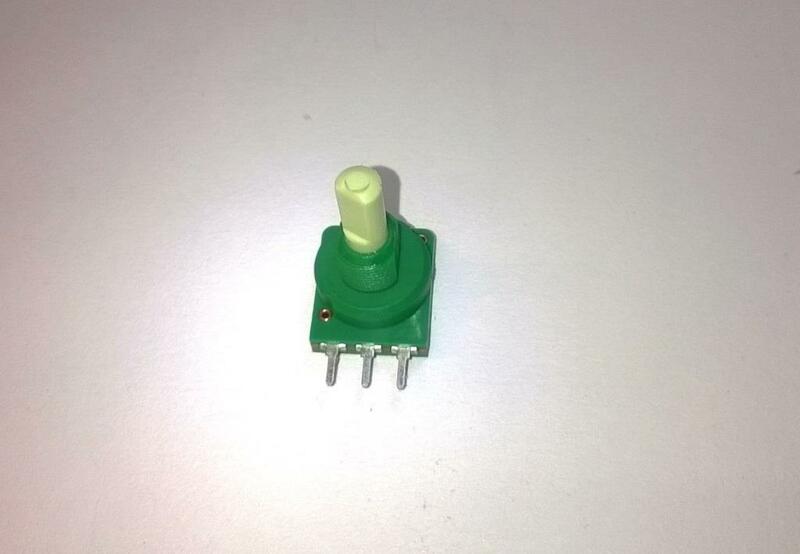 It is also used in the Single-axis ‘Joystick’ interface, pot mounted version. A lever to fit it is available separately. A standard 10K pot can be used with the Porter 40 either by adding a 10K resistor in parallel, or by breaking a track on the board. Both are detailed in the Porter 40 manual.